A cheese-dip war between two big burrito chains is heating up, prompting us to ponder some pretty deep questions — like what is queso? We're not just talking about any type of cheese here. We're talking about queso dip — the warm, stringy, gooey cheese product that's a staple at Mexican restaurants around the country and potlucks galore. This queso is not to be confused with queso fresco, the fresh, salty, farmer's-style cheese native to Mexico. After years of customer requests, Chipotle Mexican Grill finally introduced a queso dip this week in its New York City test-kitchen eatery, touting its "real ingredients." (We tried it and loved the sharp cheddar and pepper flavors, and ate the whole tub despite the slightly gritty texture.) "Making queso with only real, whole ingredients was really important to us," a Chipotle spokesperson told TODAY Food. But Chipotle competitor Moe's Southwest Grill quickly jumped into the queso debate, proclaiming on social media that there are "queso imposters" on the loose, going after Chipotle's dip for not having "any magical cheese pulls" and offering a free cup of queso to customers who download its Rockin' Rewards app. So where is queso really from? Well, the gooey queso dip that's so popular today isn't even from Mexico — it's an American invention. And as with many classic, beloved dishes, its roots and definition are widely contested. However, many food historians agree that the very first place to have served the dip, back in the 1930s, was Mexico Chiquito, a restaurant in Little Rock, Ark. — yes, Arkansas, "much to the consternation of Texans," Nick Rogers, maker of the documentary "In Queso Fever: A Movie About Cheese Dip," told TODAY Food. As to what makes a truly authentic queso, Rogers told TODAY Food that the two main essential ingredients are either Velveeta or American cheese (to get that smooth consistency and bright orange color), and it's spiced with chili powder or cumin. True queso is also eaten as a dip with fried tortilla chips — not poured on top of chips, like at a ballpark, he notes. Diced tomatoes and peppers are also often added, he said, which is why that classic combo of Velveeta and a can of Rotel tomatoes and green chilies is a quick and easy way to "get you pretty far" toward an authentic cheese dip. Flat-white cheese dip has become more popular recently as well, Rogers added, noting, "So, there are sort of two branches on the cheese-dip tree: white and orange. To me, the orange is the better, more flavorful one." For the record, cheddar is at the base of the Chipotle recipe, while Monterey Jack is at the base of Moe's. 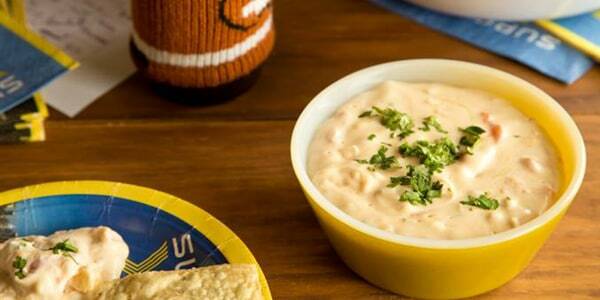 "For me, I'm a fan of the white queso. It's something I grew up with," Jason Dowd, corporate executive chef for Moe's and vice president of product development, told TODAY Food, adding that a younger cheese, which has elasticity, is key to getting that gooey "cheese pull." Since processed American cheeses have ingredients that make it a breeze to emulsify, a chef once told me that there's no shame in adding a little bit of Velveeta to more artisanal cheeses as a shortcut to get the best of both worlds: a more flavorful cheese experience and that smooth, almost runny consistency. No matter how you like your queso, once you come up with your signature spin, keep it a secret — just like the pros do. "An individual's cheese dip recipe," Rogers said, "is treated as an heirloom to be protected."